November 23, 2010 - In preparation for its 10-year anniversary next year and to highlight its many successes, the Jacksonville Aviation Authority (JAA) unveiled a new branding campaign designed to build better awareness of the city’s vibrant aviation system. The branding campaign includes a new overall logo for the authority, new logos for each of its four airports, the renaming of three of the airports and new websites. JAA was created in 2001 by the Florida Legislature and has been using the same brand identity since then. “The new ‘umbrella style’ logo concept integrates a more recognizable symbol of aviation while adding an element to represent each of the four airports in the system,” JAA Executive Director/CEO Steve Grossman said. “The connection to aviation in the old logo was less obvious and didn’t visually represent a four airport system icon.” The goal of the rebranding effort is to create a consistent brand across the four airports owned and operated by the Authority, Jacksonville International Airport, Cecil Field, Craig Airport and Herlong Airport. The rebranding effort will also be used as an opportunity to further educate the public about the distinctive differences between the four airports and the regional impact of the Authority. Three of the four airports will be renamed as a result of the rebranding effort. Cecil Field will become Cecil Airport and Herlong Airport will become Herlong Recreational Airport. Craig Airport will be renamed Jacksonville Executive Airport (JAXEX) since its location not only makes air travel more accessible for executives, but also makes the Jacksonville business community more accessible to the world. The Authority’s new logo system gives each airport its own unique identity while still fitting into a brand hierarchy for the JAA. The new logos include depictions of an airplane to symbolize the Authority, and a subtle nod to the bridges in Jacksonville that cross the St. Johns River. The new brand will focus on the tagline; “Going Beyond, Daily.” This idea represents the mission of the JAA brand to serve Northeast Florida and Southeast Georgia by positively impacting the economy, the community and the experiences of everyone who comes in contact with the JAA. The JAA rebranding effort will be carried out through several phases over the next few years. The rebranding strategy includes changes in airport signage, purchased print and television media and new websites for the Authority and its four airports. The Jacksonville Aviation Authority was established in 2001 by the Florida legislature to operate Jacksonville International Airport (JAX) and the city's three general aviation airports – Jacksonville Executive Airport (JAXEX), Herlong Recreational Airport (HEG) and Cecil Airport (VQQ). The Authority is governed by a seven-member board. 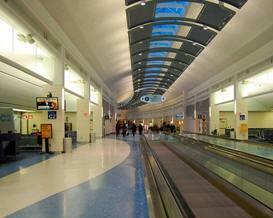 Jacksonville International Airport – funded through user fees and not local taxes – serves over six million passengers annually.